There is increasing concern about potential outside influence involved in recent political demonstrations in Macedonia following reports that students were offered up to $1,500 by an activist group to come up with the best ideas on how to protest against the country's government. The concern about overseas hands being involved in sparking protests in the country has been heightened by recent reports in Macedonian media, which claimed that activist group, Canvas (Centre for Applied Nonviolent Action and Strategies), had sent out a memo to Macedonian students encouraging them to come up with effective protest ideas. The leaked memo, sent three weeks before last Sunday's mass demonstrations against Nikola Gruevski's government, purportedly shows Canvas offering students who could come up with the best protest ideas for a grant of $1,500. The issue of Canvas being involved in Macedonia is another matter of discontent among some within the country. The Belgrade-based group was formed by Slobodan Djinovic and Srdja Popovic — activists who were considered to have played an instrumental role in deposing former Yugoslav leader Slobodan Milosevic in 2000. Canvas' website describes the group as "a non-profit, non-governmental, international network, oriented to educational work related to strategic nonviolent conflict." Meanwhile, Canvas' stated aim is to "spread the word of 'people power' to the world" and to "explain […] what a powerful tool nonviolent struggle is when it comes to achieving freedom, democracy and human rights." Despite these official statements, critics of the group have labeled Canvas professional gun-for-hire revolution makers, who work on commission to actively stir up political and social discontent in countries, at the request of international organizations that have their own vested interests. The group, which is considered to be a terrorist organization in the UAE, has also been accused of collaborating and sharing information with intelligence agencies in the past, further raising questions about Canvas' motives of their work in Macedonia. Canvas' actions in Macedonia has also been coupled with reports the group is teaming up with non-government organizations (NGOs) in the country, who are allegedly determined to see the overthrow of Nikola Gruevski's government over what has been seen as a lack of cooperation by not imposing sanctions on Russia. Among these groups is the 'Open Society Foundations,' which is one of the many NGOs set up by controversial investor George Soros, while US government agency USAID also runs various programs in Macedonia. Soros' groups such as Open Society Foundations have long been accused of representing and acting to maintain western interests in the countries in which they operate, and have been in operation in Macedonia for close to two decades, working with a range of "civil society organizations." I have long argued that a Greater Albania is emerging in the Balkans. #Kosovo was the first to fall. And next will be parts of #Macedonia. 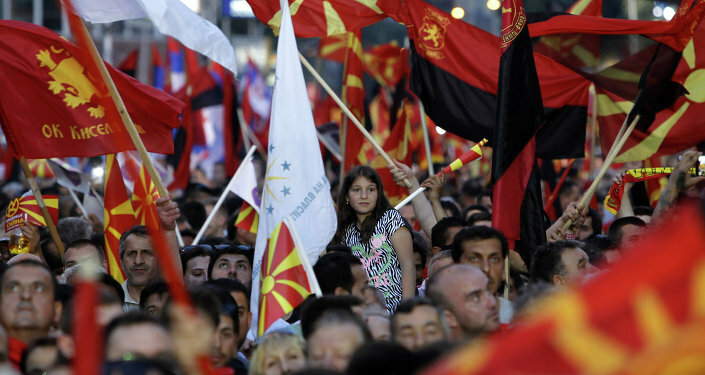 Other criticisms are that these groups take away the sovereignty of certain governments by pushing a certain agenda on the general population, with Open Society Foundations' Macedonian program focusing on "preventing backsliding in the country's efforts to join the European Union…"
These alleged attempts to influence Macedonian politics are not new according to investigative journalist Umberto Pascali, who has reported widely on the impacts and influence on NGOs in Balkan countries. Pascali said efforts by Soros' groups to destabilize governments represented the concept of the 'Fifth Column' — whereby groups attempt to undermine a government from within the country — arguing that similar efforts for a "soft coup de'tat" had taken place by Western backers in the country before. The alleged links between Canvas and NGOs such as the Open Society Foundation's Macedonia program has raised questions over the how much external influence has had an impact on the recent protests in the country, with tens of thousands turning out over the weekend to demonstrate against leader Nikola Gruevski's government. Some, including Russian Foreign Minister Sergei Lavrov have suggested the political discontent is being stoked as part of a wider geopolitical game, aimed at destabilizing the country, and subsequently scuppering any plans for Russia's Turkish stream gas line to pass through Macedonia. "There are attempts to pressure Gruevski's government for refusing to join in on sanctions against Russia and for backing the Turkish Stream [gas] pipeline [construction]," he said. "The Macedonian events are quite brutal and are being orchestrated from outside." Meanwhile, Skopje-based political analyst Vladimir Pandovski agreed with Mr Lavrov that significant outside interests are at play, and that the recent actions may not necessarily be serving the best interests of the Maceodnian people. "Everything that is happening in Macedonia has been scripted and staged. We've seen this before; it's a mix of comedy and tragedy," he told Sputnik. "Everyone is aware that this is an attempt to create a new Maidan, like in Ukraine."